Our Invisalign journey has come to a (somewhat) end and we’re so excited to show you our ‘Before and After’ results with Dr Shawn at The Dental Room. If you havn’t read our previous post on Invisalign ‘What to know before getting Invisalign‘ check it out here, as it’s jam-packed with awesome information on what to expect and what to prep for your new teeth journey. Now, I must mention that this is just my ‘Before and After’ journey, as Bec is in the process now of revising her bottom teeth. They moved very quickly and Dr Shawn wasn’t happy with how they looked. Lucky for us, Invisalign offers free revisions of your Invisalign for the first year. It’s so funny to see how much my teeth have changed since we started the process! I was always a little shy of my teeth, as they looked so small and (as I used to call them), were my wiggly baby teeth. But I’m absolutely elated with how they’re looking now and how much more confident I am with them. Also a massive bonus is that my clench or ‘bite’ isn’t as deep so I’m having next-to-no TMJ jaw pain anymore! At the end of the Invisalign journey at The Dental Room, Bec and I also added some Resin Bonding to our teeth (I did the 6 up the top and 4 front teeth down the bottom) to better improve our smile. This is something that were really comfortable doing as Resin Bonding isn’t permanent and therefore can be reversed. 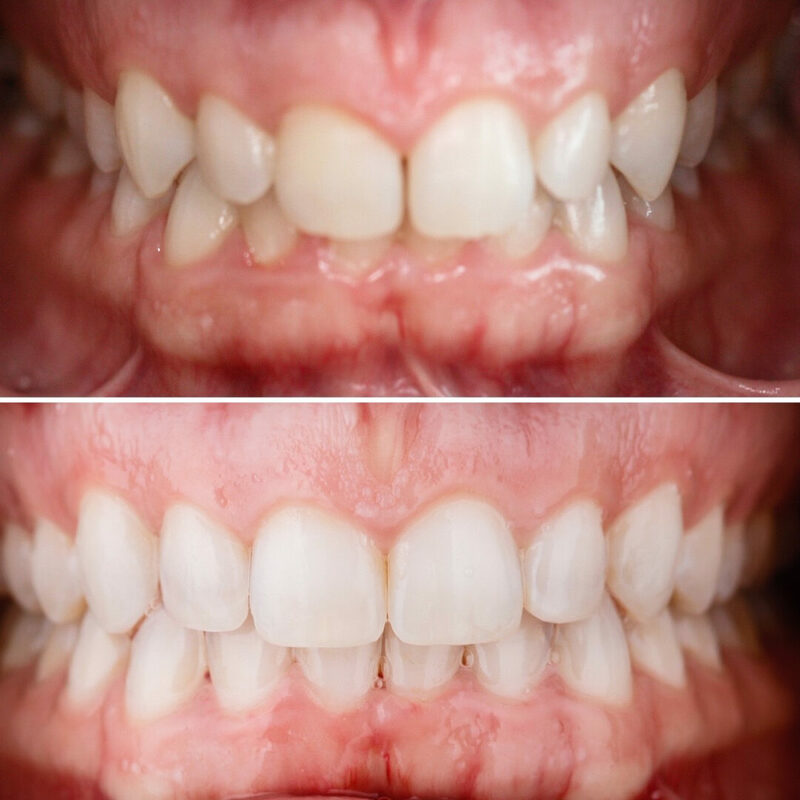 Neither of us liked the idea of having Porcelain Veneers as it’s something that we would firstly have to upkeep every 10-25 years, but also the cost was far too astronomical for us to consider (around $2,000 PER TOOTH!) 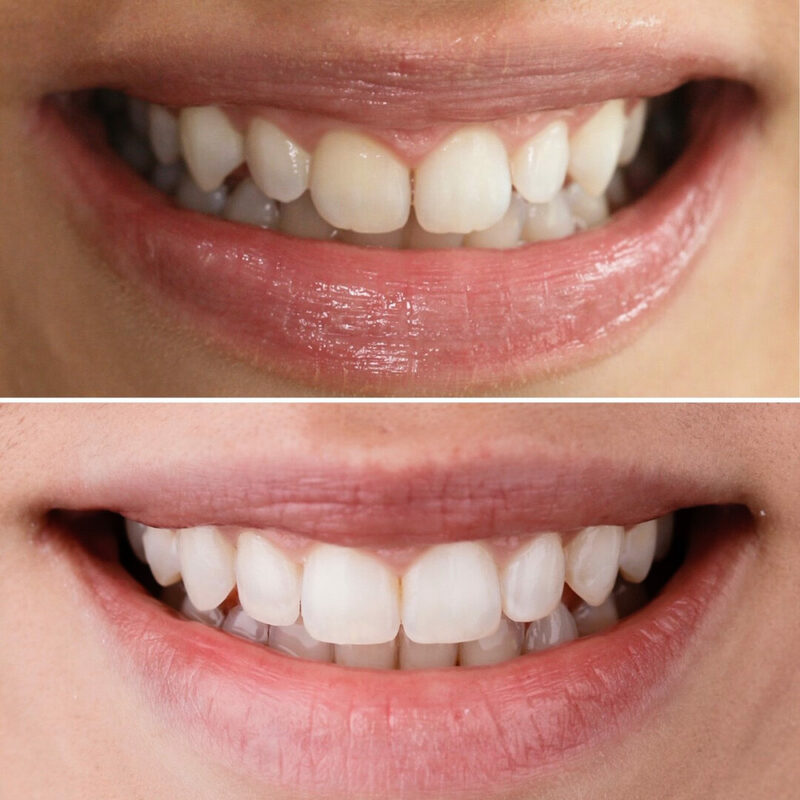 It’s also a permanent solution, meaning the tooth is modified permanently and if it chips/etc in the future, you will have to add a new porcelain veneer on it – so there is no going back! Either way, if you’re having any concerns about your current teeth-situation we strongly suggest checking our the Invisalign process and if it fits with you!